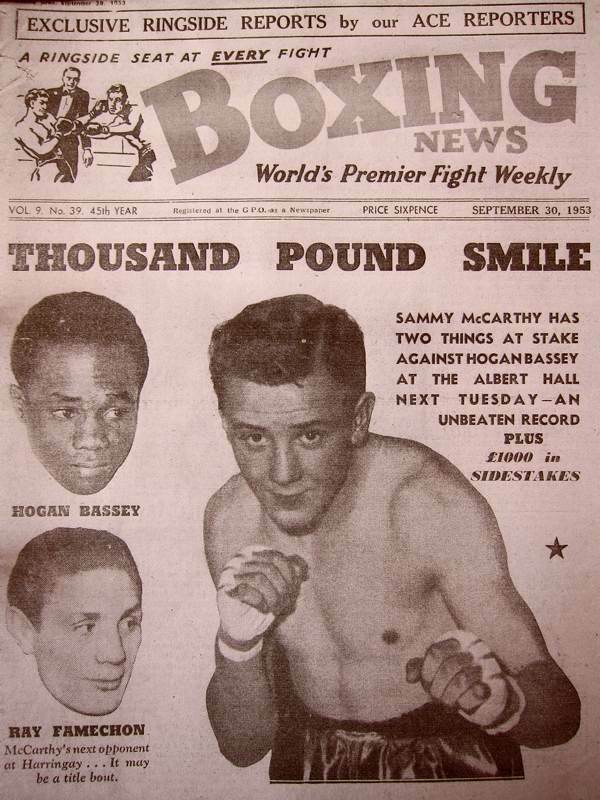 Let me tell you the story of “Smilin’” Sammy McCarthy, one of legends of East End Boxing. 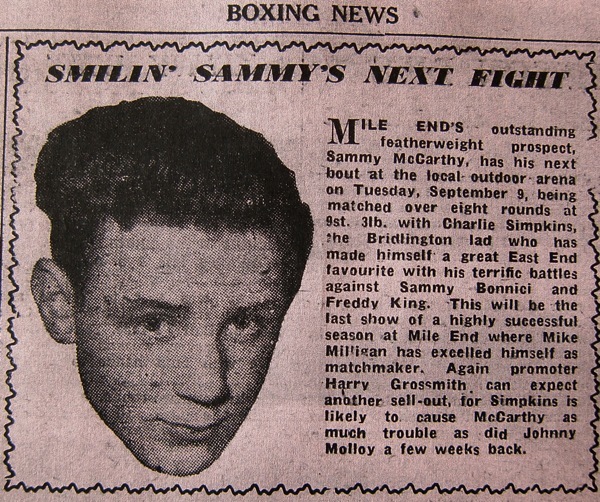 Voted “Best British Boxer of 1951″ by Boxing Times, Sammy was a golden boy who won eighty-three out of his ninety amateur contests and represented England four times in the nineteen fifties, before becoming British Featherweight Champion twice and then Lightweight Champion after that. Yet to this day Sammy is resolute in his refusal to be called a hero. 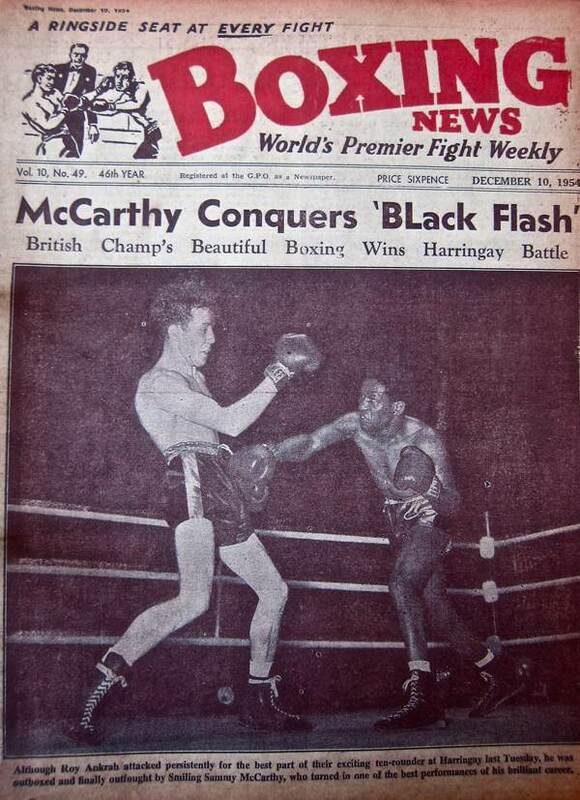 With his impeccable manners and old-fashioned proper way of talking, he is the paragon of self-effacement – an enigma who modestly ascribes his spectacular boxing career to no more than a fear of disappointing others. 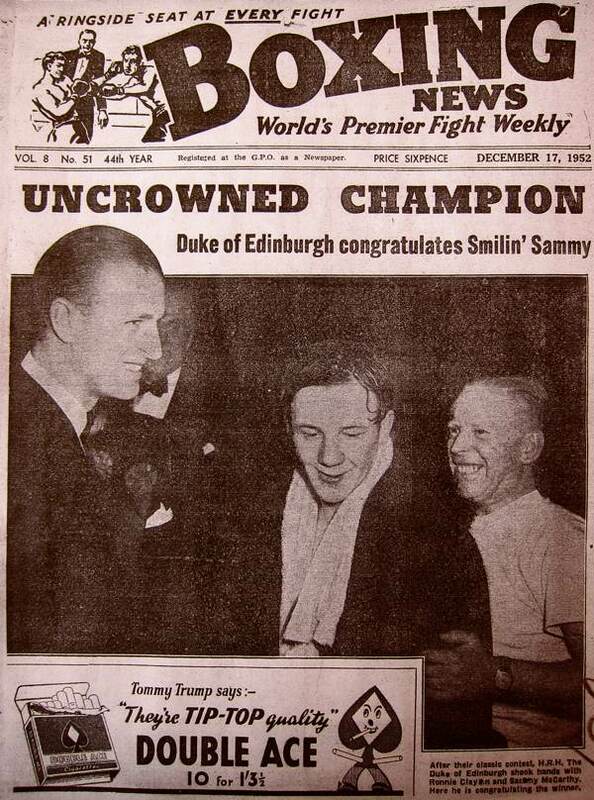 His contemporaries informed me that only once I knew about his background, could I fully appreciate the true impulse behind Smilin’ Sammy’s suave temperament, but what I discovered was something far more surprising than I ever expected. Born in 1931 as one of ten children, Sammy grew up in a terrace off Commercial Rd next to Watney Market as the son of costermonger. 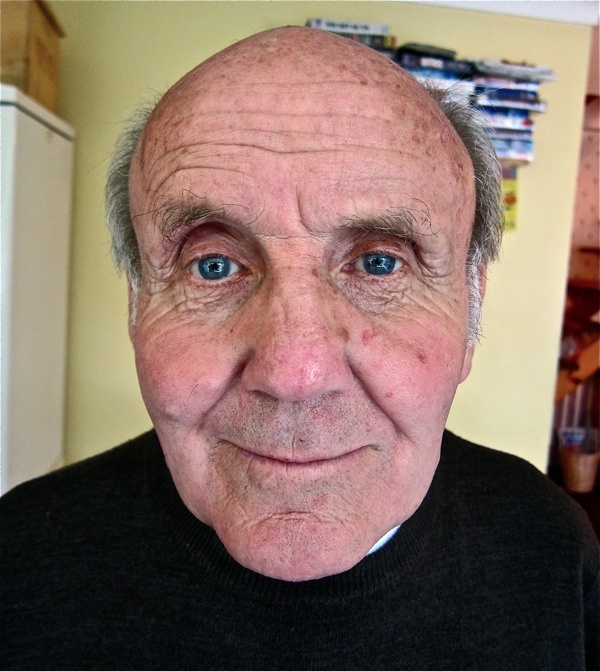 “My father used to go round the streets selling fruit and veg and we all helped him, and I helped him more than anyone but I always hated it,” Sammy revealed to me, explaining how he visited Spitalfields Market each day with his father in the early morning and stood outside the church while his father bought the produce. Then Sammy had to wheel the loaded barrow back to Stepney but, although it gave him the physical strength which made him a boxer, it was also was a source of humiliation when Sammy’s schoolmates jeered. “Subconsciously, I suppose I was a bit of snob – I wanted to be posh even though I didn’t know the meaning of the word.” he confided with a blush, expressing emotions that remain current even after all these years. “I had a great following thanks to my two uncles who sold tickets and everybody in the markets bought them because my brother was already well-known. 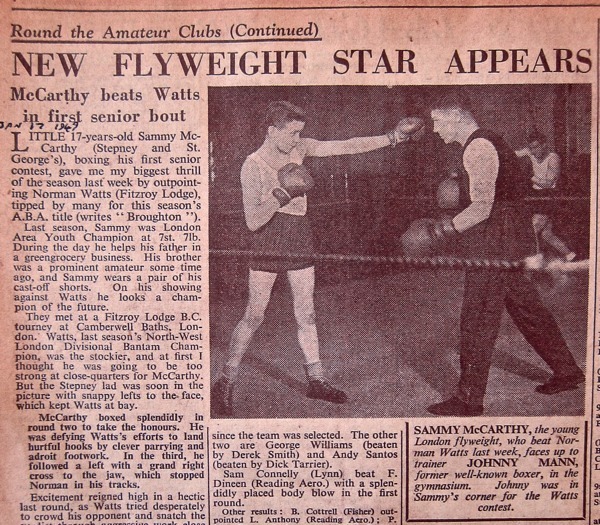 So there used to be coach loads coming to watch me box and I was always top of the bill, not because I was good but because I always sold plenty of tickets.” It was a characteristic piece of self-deprecation from a champion unrivalled in his era. At nineteen, Sammy turned professional under the stewardship of renowned managers Jarvis Astaire and Ben Schmidt. “Every time I go to West End, I still go to Windmill St and stand outside where the training gym used to be. All the big film stars, like Jean Simmons and John Mills, they used to go there to the weigh-in before a big fight.” he told me proudly. “My boxing career, it gave me confidence in myself. 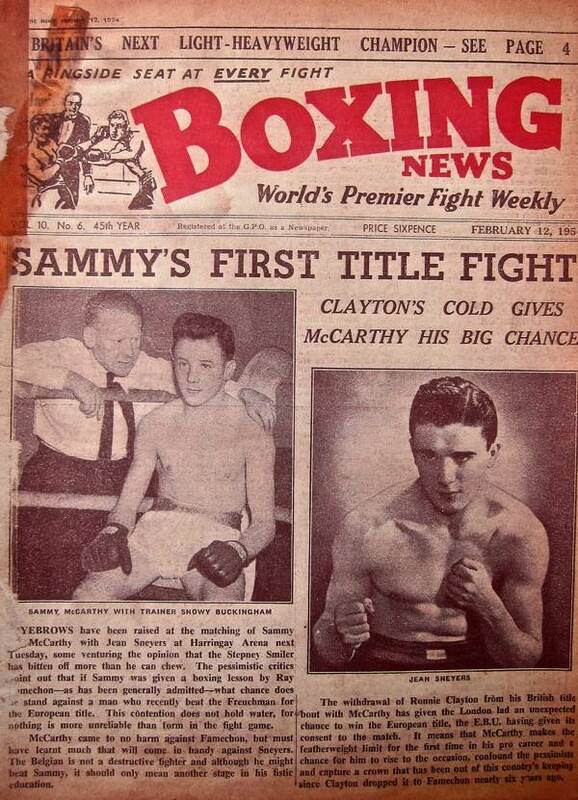 Boxing made me happy.” Sammy concluded as our conversation reached its natural resolution,” I didn’t enjoy the fights, but I love the social life. You meet the old guys and you realise it’s not about winning, it’s about giving of your best.” Living alone, Sammy leads a modest bachelor existence in a neatly kept one bedroom flat in Wanstead and he meets regularly with other ex-boxers, among whom he is popular character, a luminary. There was a silence as Sammy summoned courage to speak more and I sat transfixed with expectation. “I robbed banks and I stole a lot of money, and I was caught and I was put in prison for years.” he said. “I’m reformed now.” he stated, just to be clear. “I was alright in prison because I’m comfortable with my own company and I read books to pass the time,” he added, to reassure me. “But why did you do it?” I asked. Subsequently, a little research revealed that Sammy had been convicted three times for armed robbery, and served sentences of three, six and fourteen years. When I think of Smilin’ Sammy now, I think of his sweet smile that matches the Mona Lisa in its equivocation. It is a smile that contains a whole life of fear and pain. It is a smile that knew joy yet concealed secrets. It is a brave smile that manifests the uneasy reconciliation which Sammy has made with the world in the course of his existence. 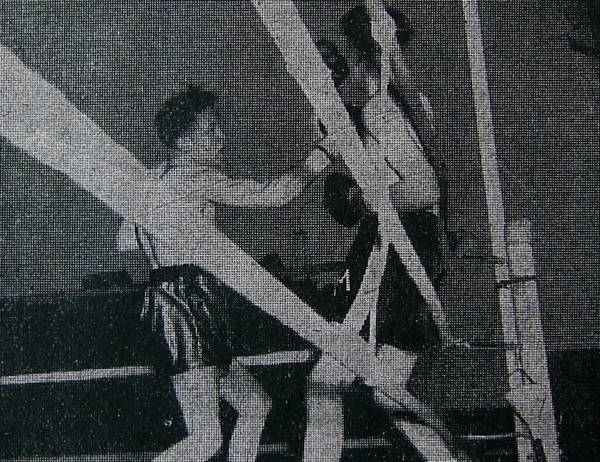 Sammy McCarthy, the Stepney Feather, has Peter Morrison against the ropes under a fierce attack at the Mile End Arena. 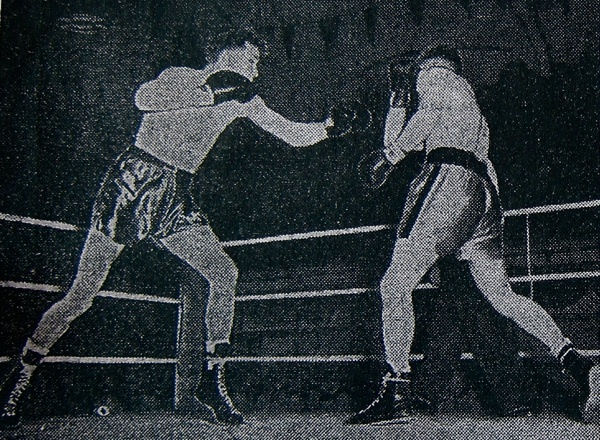 Sammy McCarthy makes Denny Dawson cover up under a straight left attack. 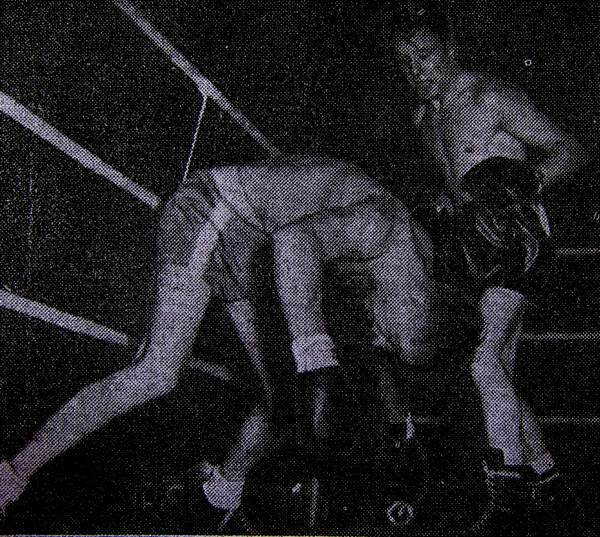 Jan Maas goes headlong to the canvas after taking a Sammy McCarthy “special” to the chin. Still smiling! 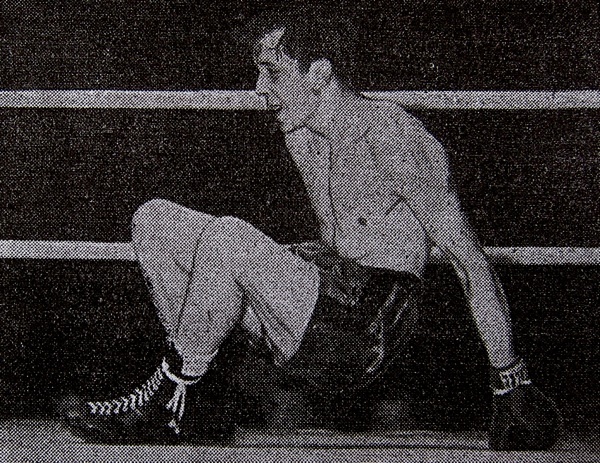 Not even a knockdown can remove the famous smile from Sammy McCarthy, as he goes down for a count of “eight” in the fifth round. A wonderful and moving story. I almost didn’t read this as I am no fan of boxing but I am glad I did. Once again G.A you have produced a moving picture of a real human life. Like you, didn’t see that one coming. My friend Terry Bryan tells me that he was an aquaintance of yours at the Broad Street Club many years ago. Terry sends his best wishes to you. Regards, Ron Pummell. Sammy is one of life’s characters,always has time for everyone,always smiling,willing to do anything for anyone,pleased to be one of his numerous friends. To anybody who has met little Sammy, he is a Big, Big man,and has the respect of everyone in boxing circles, and beyond, he is an inspiration to those who have sometimes gone astray, and shown it is possible to make amends, and pursue a normal and happy life. 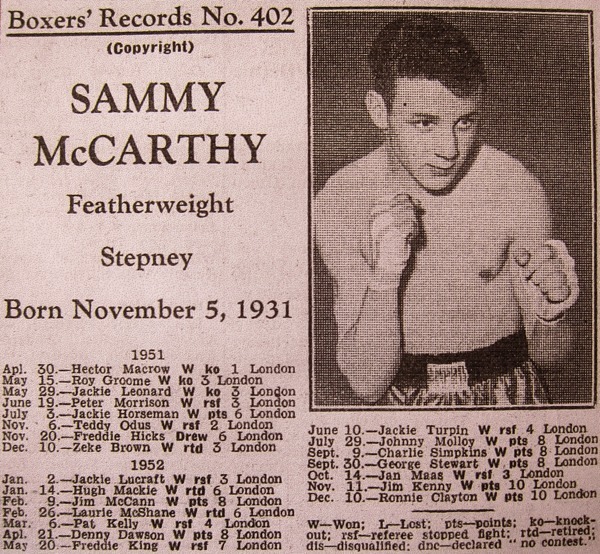 I’m alost exactly a year younger than Sammy, was born and brought up near Watney Street in Stepney and knew the McCarthy family very well. In my professional career (not boxing)I came across Sammy many times, but I do wish he would call me by my first name – not “Mr Giller”. Sammy loved the feeling of being terrified – that’s why he took up his 2nd “profession”. Victims of, and witnesses to the robberies, always spoke of the politeness of one of the robbers – and Sammy was soon ‘nicked’. Sammy, I haven’t seen you since that day at the London Crem., but I’ve thought a lot about you – especially since ‘Enry passed to the Gym in the Sky. I remember Sammy , walking up Cowley Rd Wanstead some mornings as I delivered papers as a boy , he always said good morning , I would sometimes add ” nice out ” and he would reply ” yes , I think I’ll stay out ” , I used to love talking to him , it made my day . I have the honour of knowing Sammy, a true gentleman, I now live in Jersey but was born in Watney street, through Billy Walker who also lives in Jersey, Sammy telephoned me at home in Jersey, we and had a long chat, which was wonderful, I hadn’t seen him for many years since my running days over Vic’y Park, were Sammy would also run around. I was so pleased he still remembered me and my farther Harold. Enjoyed the story and the great pictures all of which bring back a lot of memories of Shadwell and Spitalfields. Wonderful to see you looking great Sammy. All my memories of you from a kid growing up in Stepney were great ones. Your smile and lovely nature are still vivid in my memory. Great story. Just discovered this site a few days ago and haven’t stopped reading it since! Hello to all those who have responded! In response to those who are related. Fred McCarthy married Maude Cecil. Sammy McCarthy was their son. What side of the family are you from? Sammy’s sister was my nan, Joanie. She sadly died but the rest are still alive. If you google you tube Sammy’s McCarthy’s sisters, you will find a wonderful clip of them from when Sammy appeared on this is your life. I remember Sammy from Maidstone 1976-80!! Wonder if he remembers me or my brother (Alfie)? Signwriter red-bands! Even in that world of hard-noses Sammy was universally liked. I’ll always remember how he demolished the marathon against fit lads half his age his age! Not bad for an old plodder. Sammy always has my utmost respect, long may he reign! I remember sammy in Maidstone as well as the Holmes bros above as we all shared the same wing (kent) for years. The most humble and politest man i have ever had the pleasure to meet. His smile and charisma was a daily helping hand to anyone who found it hard. He may have been twenty years my senior but by Christ he was fit. He outshone all!! Just see a clip of you on utube, fantastic. God bless you sammy. I had the privilege of approaching and speaking to Sammy for the very first time this morning on the platform of Snaresbrook tube station. What a lovely man and such a gentleman. He is in brilliant condition for a man of 82, no doubt due to his pounding the streets of Wanstead for so many years, always with a smile for everyone as he jogged past. I did not know his name until this morning. This website is a great tribute to him. I was at Wanstead High school with Sam’s daughter Jackie, I was also known as Jackie back then. 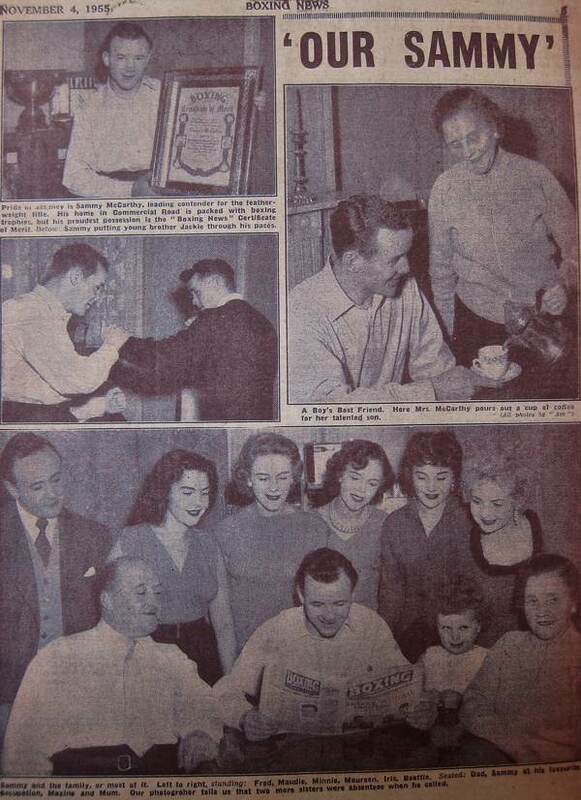 It was so lovely to read this article about her dad Sam, a lovely man, and I remember Jackie was very pround of her dad. If anyone can get a message to Sam for his daughter Jackie to say that her old school mates, the other Jackie, Kim and Tina are getting together in August 2015 in Wanstead for a reunion and would love her to come too and that she can contact me on the the above address (jacquelinepdixon@hotmail.co.uk). 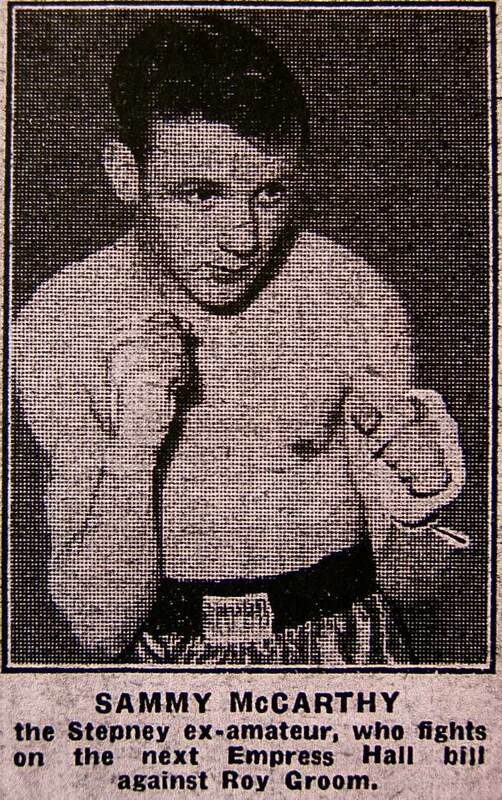 From memory, my father, Stanley Ekins, who boxed mainly in North London, retired unbeaten from amateur boxing in the early 1950′s. 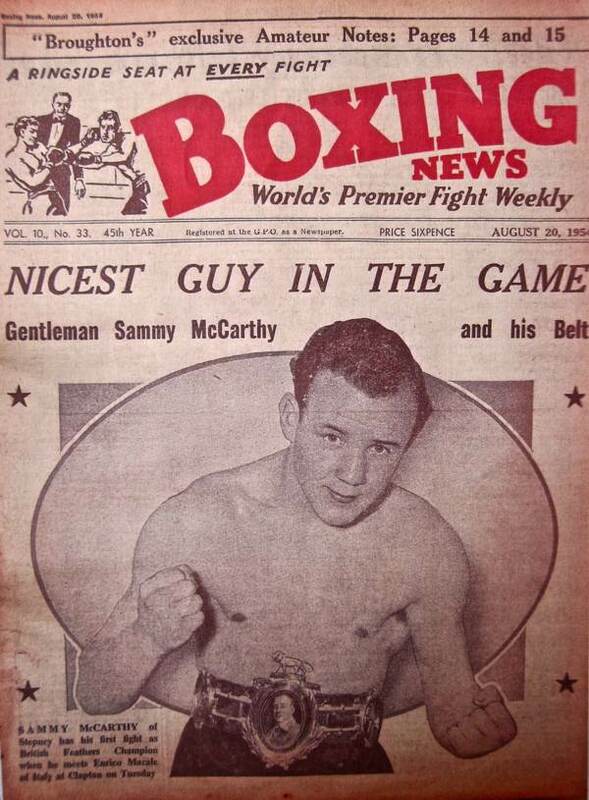 I believe that he either boxed Sammy McCarthy as amateurs or was well acquainted with him. Does anyone have any information that could turn my memories in to facts? 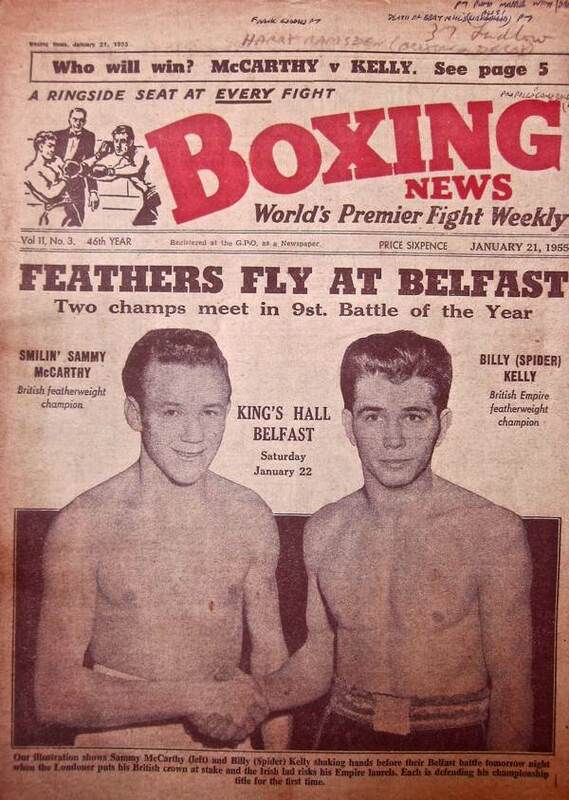 For Sammy McCarthy – my father was a great Light Heavyweight out of Arbour Youth in the 1950′s (Amateur) – name, Michael Faulkner. You presented his Grandson with a winners trophy at a Dagenham ABC show on 07th February 2009. 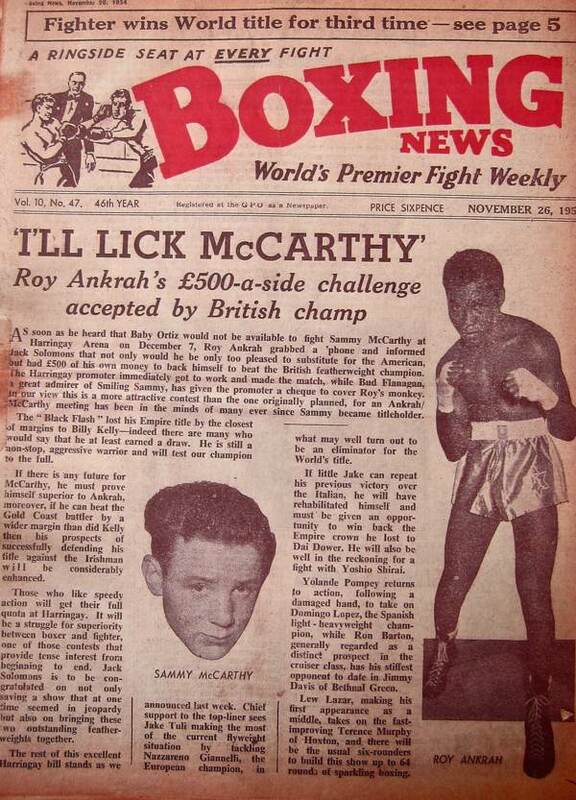 His name is the same as my fathers, Michael Faulkner – when I told my dad who had presented it, he was so chuffed – “Ol ‘Smiling’ Sammy McCarthy eh? – good on him, hope he’s well and give him my best!” he said – which I did. 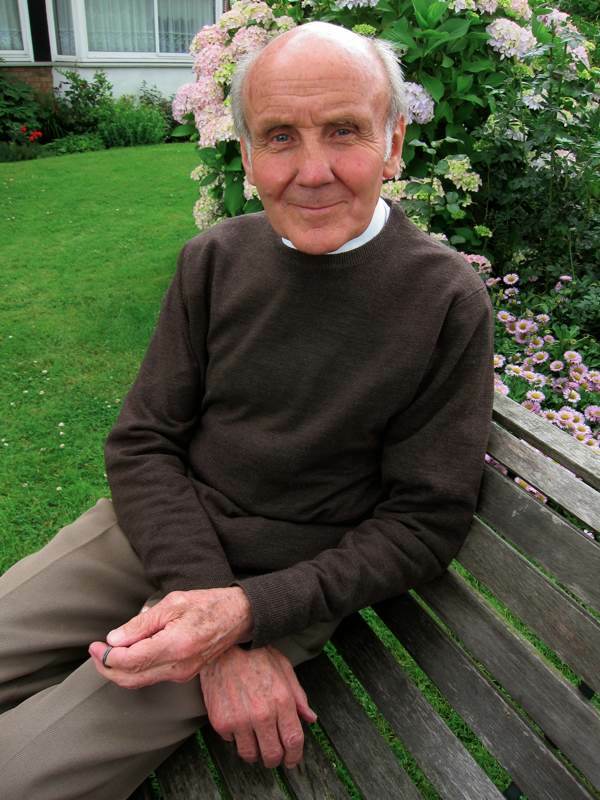 we live in Wanstead and my husband was born on isle of dogs , Sammy McCarthy has lived around here for a very long time , he is a lovely sweet natured man and its hard to think that he has ever done any wrong . Saw him a few weeks ago in Wanstead high st. and as ever the manners of a gentleman ! Chivalry is not dead , know that this sounds odd in connection with a know felon but I feel this is true for Sammy McCarthy . Great article. Yet another relation here. 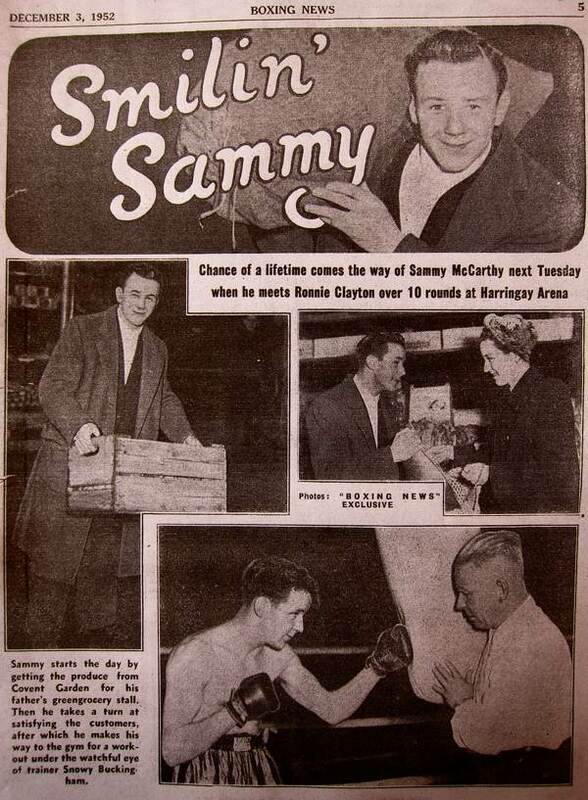 My grandfather Freddy McCarthy used to speak fondly of Sammy and his boxing exploits (and the later troubles that came along). Freddy married Jane nee King (Cohen) and had 3 children Irene, Freddy junior and Patricia (my mother). Unfortunately their house in Stepney was flattened during the blitz and they moved to Gloucestershire and with the passing of many years, all contact was lost with this side of my family. Sammy is one of today’s Gentleman with old school values! I have known Sammy for many years and I feel very special when ever we meet. Like everyone known to Sammy he always greets you with enthusiasm and that wonderful smile of his! My Uncle Burt Higgins was married to Sammys sister Eileen who had a son and daughter, Marie and John (my cousins). Would love to know if Marie is still alive or John if anyone knows. Very proud to be a relative of Sammy even though only by marriage. I remember his brother Fred and wife Phylis with their egg stall in Watney Market when I was a kid. Really lovely people. A true gentlemen and a lady.